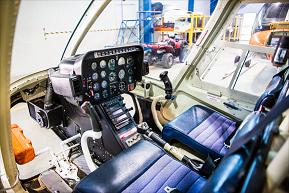 Our premises are purpose-built for flight training which allows us to provide our students the benefit of a 5,000 square metre facility with state-of-the-art training aids and the best available resources for pilot training. We have set the benchmark for pilot training in the region. The training facilities are co-located within the Horizon campus area and the dispersal consists of thirteen helipads which are adjacent to the Al Ain International Airport runway threshold. The climate provides year-round sunny skies minimizing the number of days lost due to poor weather conditions. The desert terrain has the additional benefit of presenting many opportunities for limited power scenarios, mountain flying, and desert training conditions.